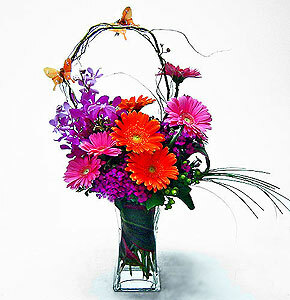 Gerberas, orchids and dianthus with vibrant butterfly accents are a great way to send your warm thoughts. Arranged in a contemporary glass vase, this design is perfect for so many occasions – from birthday wishes - to get well thoughts - to saying ‘just because you’re special’. Your flower arrangement is designed with gerbera daisies, Orchids, hot pink dianthus and hypericum berries and is accented with butterflies and curly willow.